With the renovation of Cincinnati’s urban core nearly complete, neighborhoods near downtown, including Over-the-Rhine, Camp Washington, Price Hill, Brighton and Northside have become hot places to live. They also have increasing neighborhood entertainment and art districts. Artists’ studios are now located in all those areas. Where artists’ studios are, galleries follow. One of them is Wash Park Art gallery, which opened October 18, 2013, and is located at 1215 Elm St. in Over-the-Rhine. “The location chose the gallery,” said Spraul, who frequented OTR before its revitalization. When she found the listing, she thought an art gallery would add to the park’s home of Music Hall, Memorial Hall, the School for Creative and Performing Arts and the Cincinnati Shakespeare Company in 2017. The building is designed in a classic Italianate style with the date 1887 featured in its cornice decoration. It was built to coincide with the city’s 1888 centennial celebration and exposition at the park and Music Hall. “When I discovered CSO’s founding conductor Frank van der Stucken boarded there, I knew I had found what I’d been scanning for,” Spraul said. As a trial lawyer, Spraul developed a case theme, curated facts and presented them to a jury or judge. How does that translate to art? With art and law, she uses her analytical observation, synthesis and assembly of thoughts and conclusions, and persuasive communication. At the gallery, she develops an exhibit theme, curates artworks and presents them to gallery-goers and collectors. She targets her audience as a community of urbanites, concertgoers and art lovers who have found their way to the gallery en route to Music Hall or Washington Park. The members of her evolving group are well-read, well-experienced and curious about ongoing education, and broadening experiences. Spraul offers gallery talks, salon discussions, readings and other programs to reach an audience sincerely interested in art and its role in understanding the world. She chooses what she considers excellent art of any genre for the gallery. Two rental apartments sustain the building, while Spraul manages the 1,000-square-foot site on the first floor. She thought the first floor would be a good space for a solo show. Spraul soon discovered: “A gallery is not for dilletantes. It takes a lot of time.” She thinks about her work 24/7. It isn’t just about having exhibits; a flood resulted from a toilet tank rupture on June 14 earlier this summer. Site construction for Washington Park affected some of the foot traffic and accessibility. “It irritates me that people don’t see the purpose of art,” Spraul said. For March/April 2017, Spraul has scheduled two Ukrainian artists, photographer Guennadi Maslov and constructivist painter Audrey Kozakov. The April/May show presents Paul Schranz’s photography and Rowland Augur’s mixed media sculpture. In September/October, the show’s title is REOPENINGS: Here and Havana, including photography and canvas art of both Music Hall and Cuba. This exhibit coincides with the reopening of a renovated Music Hall in 2017. Also in September will be FutureNOW, the gallery’s annual celebration of student work, showing select advanced placement portfolio work from Oak Hills High School art students. Wash Park Art is open Thursday 11:00 a.m. – 3:00 p.m., Friday 5:00 p.m. – 8:00 p.m., Saturday 2:00 p.m. – 5:00 p.m., and Sunday 2:00 p.m. – 4:00 p.m. It is conveniently located near streetcar stations #8 or #4, three doors south of Music Hall. Phone number is (513) 291-3626. Website is www.washparkart.com. Rachael Moore moved to Cincinnati in 2010 from New York when her husband John Godsman transferred to General Electric as general manager, business development. “There were too many people jostling for attention in New York,” she said. She started purchasing art when she lived in New York City as well as London. Based on this experience, she felt she had insight into why people buy art and hoped to bridge the gap between collectors and artists. Moore opened Cincinnati Art Underground at 1416 Main St. in November 2015. “I was fascinated with the people and the enthusiasm for art in Over-the-Rhine,” she said. The gallery is 800-square-feet with shows changing every six to eight weeks. She focuses on a range of contemporary art, including paintings, sculpture, ceramics, photography and works on paper, in what she calls her boutique gallery. She likes showing younger artists as well as hosting pop-up shows. She also hosts gallery talks, offers concierge art services and works with interior designers. “Not everyone understands an art gallery,” she said. Moore is not an artist herself. Her educational background is a law degree from Hofstra University in New York and a degree in international affairs from the University of Colorado in Boulder. Moore finds an abundance of art from local, national and international artists. “Finding artists is easy, curating a show is not,” she said citing challenges in time and money. She didn’t hesitate to start CAU as a commercial gallery. “I like the simplicity of featuring works and selling on behalf of artists directly to people who want to buy them, rather than going through the fundraising and board situation of a nonprofit,” she added. Moore plans on featuring a varied range of artists in the future. They include a multi-media painting and photographic collage artist paired with a glass artist. Or, wood sculptures made by an expert woodworker and furniture maker. “I want to explore different ideas through the artists that I bring to the gallery and share those ideas with everyone who attends our shows,” she said. Although many of the artists whom she features are from the Greater Cincinnati area, some are from across the nation or world. “Young buyers also like the idea of new art. Instead of looking into the past, as many museum collections do, by supporting young artists, they are investing in a career with future potential. They become part of a new chapter in art history.” She has reached out to other galleries for collaboration on projects and to feature some of the artists she exhibits. Hours are Wednesday – Sunday 12:00 p.m. to 6:00 p.m. Phone number is (513) 903-0623. Website is www.cincinnatiartunderground.com. Nicholas Yust operates The Yust Gallery at 3602 Eastern Ave. in Columbia Tusculum. It features original and signature series of metal sculptures. Yust opened the gallery in March 2015. In the first ten months of his business opening, he sold 73 original works of art. A native of Delhi, he moved to Oakley in 2004. He received a BS and MS in metallic engineering from Wright State University, but is self-taught in art. Yust worked at General Electric Aviation as a metallurgical engineer from 2004 to 2009. He bought a home in Columbia Township in 2007. Yust had a strong vibe about the neighborhood and the traffic. “This neighborhood is buzzing with character and development,” he said. Originally, artwork was a small business on the side. 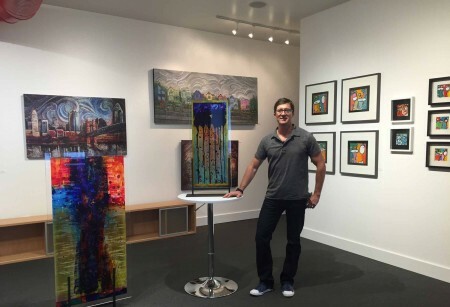 With his enterprise doing well, he found that he was making his footprint in the art world. “I always wanted to run a business,” he said. Yust specializes in contemporary and eclectic fine art from nationally and internationally renowned artists, who produce abstract metal art, mixed media, glass, acrylic paintings, abstract and assemblage sculptures. He chooses artists based on the unique use of their mediums/materials and his enthusiasm to help extend their creativity and reach a worldwide platform. Yust is promoting the gallery as an entertainment venue in addition to choosing selected artists. As with other new gallery owners in this article, he would like to make his location a hub for artists. His long term view for exhibiting artists is to offer them a platform to broadcast their creativity and build their reputation. “We achieve this through local exhibition, displaying at national fine art shows, advertising in art related media and reaching a worldwide audience through our extensive and optimized websites,” said Yust. Artwork that Yust Gallery displays appeals to a broad range of art enthusiasts. “We have found that contemporary art infused with vibrant colors, unique textures and materials evokes excitement in people of all ages. Attracting young buyers is definitely a challenge. However, we have found that social media is the most effective way to engage them,” said Yust. This gallery collaborates with several galleries, nonprofits and charities. It contributes over $10,000 of artwork each year to nonprofits and charities in Cincinnati as well as other organizations across the United States. Hours are Tuesday, Wednesday, Thursday and Friday 12:00 – 6:00 p.m.; Saturday 12:00 p.m. – 3:00 p.m. Phone number is (513) 284-6737. Website is www.nicholasyust.com. Wave Pool Gallery at 2940 Colerain Ave. acts as a contemporary art fulfillment center. According to the website, it is distinct in its passion for helping young artists. Skip and Calcagno Cullen opened the gallery in February 2015. They wanted to create a place in Cincinnati that supported experimental, contemporary artists, a place that elevates and celebrates local work done here while bringing it into context with national and international trends and topics discussed in the art world. The Cullens thought there was a lack of a support system for artists and began hosting critique nights, a variety of artist-driven programming and offering studio and work spaces. They chose Camp Washington because of its reasonable rates. Located in an old firehouse, Wave Pool houses a gallery, artist studios and a wood shop. The gallery is a nonprofit 501©3 open Thursday, Friday and Saturday from 12:00 p.m. to 5:00 p.m. Wave Pool offers a residency program, Art Space is Your Space, which gives artists a small stipend and live/work space to create work with and for the larger community. These artists also receive a solo show in the gallery. Other exhibits tackle a certain theme or topic. In 2017 shows focus on political feminist art, organic growth systems, map making as art and animal communication systems. The Cullens aim to reach a broad and diverse audience representative of the people who live in Camp Washington. “To do this, we support socially-engaged art projects whenever possible, possibly those that benefit our immediate neighborhood,” said Cal Cullen. While Wave Pool sometimes has art for sale, it more frequently presents work that acts as a catalyst for change, according to Cullen. Often, these pieces take the form of video, performance, installation or even an intangible experience. “The works that we support and exhibit range from a more traditional painting on the wall to wheat paste installations around our neighborhood to temporary workshops or interactions with artists in public spaces,” said Cullen. “Cincinnati does not have a strong art collector base,” said Cullen. “Though selling art is not really part of our business plan, we do want to nurture collectorship in Cincinnati as a way of meeting our mission. To do this, we have started our Corporate Art Loan Program, which allows businesses to rent art from artists for their offices,” said Cullen. Wave Pool owners work with other nonprofits and galleries often. “We have collaborated on programs with the Contemporary Arts Center, The Carnegie, 21c Museum Hotel, Heartfelt Tidbits, Camp Washington Community Council and Cincinnati Dark Asana Yoga,” said Cullen. Major galleries throughout Cincinnati have changed hands. Norm and Barbara Miller sold art at Miller Gallery for 55 years on Hyde Park Square. The store was passed on to their daughter Laura Miller Gleason and her husband Gary. In February 2015, Jayne Menke assumed ownership. It reopened, still carrying the Miller name, in October 2015. Randy Sandler sold Cincinnati Art Galleries, LLC, to David Hausrath, former senior vice president and general counsel, Ashland Co., on July 15, 2016. 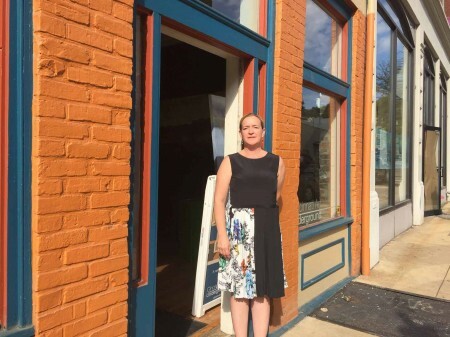 After many years in the art business, Sandler will remain as a consultant for three years at the store, 225 E. 6th St. Hausrath said that continuity is important with a clientele that has remained loyal to CAG. “Randy and Michelle Sandler ran the business as a top flight gallery with a great reputation,” said Hausrath, who considers art his true passion. Carl Solway Gallery, founded in 1962 and currently located at 424 Findlay St. in the West End, is now managed by Michael Solway, Carl’s son. The 12,500-square-feet of space in a historic warehouse holds modern and contemporary art. A corollary to this story is the Walnut St. Corridor, which includes the Lois and Richard Rosenthal Center for Contemporary Art, the Weston Art Gallery and the 21c Museum Hotel, as part of the downtown entertainment district. Angela Jones of HudsonJones Art Gallery in Camp Washington declined to be interviewed for this story. Interesting story about the local art gallery boom. I wanted to alert your readers to yet another new gallery: Gallery 708. It has been in the planning since last spring and features the work of 29 area artists and artisans working in a wide range of mediums: steel, fiber, watercolor, oil, glass, clay, bronze, calligraphy, college, mosaic, silver and wood. Some are exclusive to the gallery. It opened on Election Day in a newly renovated 3,700 square foot space at 708 Walnut St. in the heart of what the gallery refers to as downtown’s Visual Arts District. The Contemporary Arts Center, 21C Hotel and Museum, Weston Art Gallery, YWCA Women’s Art Gallery, and the main branch of the public library (which often features art exhibitions) are all within a block of 708. The Grand Opening is 5-9 pm Thursday Dec. 1. It is free and open to the public. Regular hours are 11 am-7 pm Tuesday-Saturday (closed Sunday and Monday). For more information, visit Facebook (search under Gallery708). The gallery web site (www.gallery-708.com) will be coming soon.